Clean Air in London (CAL) has found the Government covered-up three legally-required smog warnings in the fortnight after launching a consultation proposing changes that would scrap or reduce air pollution monitoring, reporting and local air quality management by local authorities across England. Separately, the Government assured CAL in a letter dated 4 September 2013 that ‘Defra’s air pollution alert systems are automated based on data in the UK-AIR website databases and the UK wide network of stations which form part of Defra’s compliance monitoring network’. However, after CAL requested clarification Defra admitted ‘this actually corrects the [email attached to the letter] which assumes this tweet would be automated’. Government ‘Information alerts’ are not automated. CAL used powerful European access to environmental information laws to expose catastrophic failings in the Government’s own monitoring and reporting of air pollution. Defra launched a consultation on the future of Local Air Quality Management on Tuesday 12 July with a closing date of Friday 30 August. In apparent panic, after widespread media and public condemnation of their proposals and for holding a consultation over the summer holidays, Defra delayed the deadline for responding to its consultation to Friday 13 September. Scrap some assessment and reporting: Remove the need to carry out ‘Further Assessments’. Review the need for continued assessment and reporting on objectives that have been met. Scrap most assessment and reporting: Option 1 plus change focus from review and assessment and reduce reporting. Scrap most local authority duties: Option 2 plus: scrap local authority duty to carry out detailed assessments or to make/amend Air Quality Management Areas; and scrap reporting requirements for local hotspots. Scrap all local authority duties: Repeal Local Air Quality Management duties in the Environment Act along with Air Quality England Regulations. Amend regulations as in Option 3. No specific duties on local authorities to assess or report on air quality locally. Defra says Option 3 is its preferred option. Its own Impact Assessment shows that Option 3 would result in local authorities scrapping up to 117,360 nitrogen dioxide diffusion tubes per annum plus up to 600 sites monitoring oxides of nitrogen and 200 sites monitoring dangerous airborne particles (PM10). 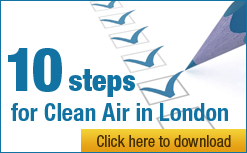 In media comment, Defra has stated that local air quality monitoring is not a statutory duty for local authorities. However, this is totally disingenuous since local authorities are under a statutory duty to ‘assess’ local air quality (which requires monitoring). Annex XVI specifies minimum information to be supplied to the public. ‘Inform’ is an ‘action verb’ not the passive posting of a notice on a technical website. Defra failed to ‘inform’ the public (and actively misled it by tweeting ‘MODERATE’) after posting an ‘Information alert’ on a separate air pollution website at about 1700 after its monitor in Brighton – Preston Park recorded average one-hour ozone of 182 mg/m3 at 1600 on 22 July 2013. In essence, the Government says another monitoring network is ‘separate’ and blames [sudden and] ‘worst case’ instrument malfunction/vandalism/power failure respectively for its failure to issue ‘Information alerts’ required under UK and EU law. In a third incident, the Government misled the public by tweeting about MODERATE air pollution instead of issuing an ‘Information alert’. Government blames ‘communications’ failures for two other monitors going offline hours before an ‘Information alert’ might have been required. The Mayor comes out of this badly too. He has refused to issue smog warnings saying they are the Government’s responsibility. No-one therefore issued a warning when the ‘Information alert’ threshold was triggered at London – Barnes Wetlands on 16 July 2013. This is inexcusable. The importance of smog warnings and independent monitoring and reporting cannot be emphasised strongly enough. The Mayor estimates there have been hundreds of additional hospitalisations in London in recent years during smog episodes. In a nutshell and against a backdrop of catastrophic failures of the Government’s own systems, the Government is proposing to scrap completely or reduce the need for monitoring and reporting of air pollution by local authorities. Options 1 and 2 would lead to the demise of continued assessment and reporting at least on objectives that (the Government wrongly alleges) have been met e.g. dangerous airborne particles (PM10). Options 3 or 4 would involve scrapping Air Quality Management Areas (AQMAs) and/or all separate Local Air Quality Management (LAQM) duties. It is not clear whether the Government would even continue to comply with the EU legal requirement to operate its own more limited monitoring network (currently 128 monitors nationally and 300 in total). drive a coach and horses through fundamental protections in the planning system. All four of the Government’s proposals are therefore unacceptable. The Government should go back to the drawing board to develop powerful aims and an approach which builds on the strengths of the current Local Air Quality Management system not undermines it.